Sharjah - 30 December 2018: Hundreds of people from all age groups participated in the “One Hour Walk 2” event, which was organized on Saturday by the Friends of Arthritis Patients Association at the Supreme Council for Family Affairs in Sharjah. The event, which was organized in cooperation with the Sharjah Police Headquarters, took place at the Sharjah Police Desert Park. The event included the participation of a large number of students from schools and universities, as well as government and private institutions in Sharjah. The event was also attended by HE Major General Saif Al Zari Al Shamsi, Commander-in-Chief of Sharjah Police; Waheeda Abdul Aziz, Head of the Friends of Arthritis Patients Association; and representatives of several government agencies in Sharjah. 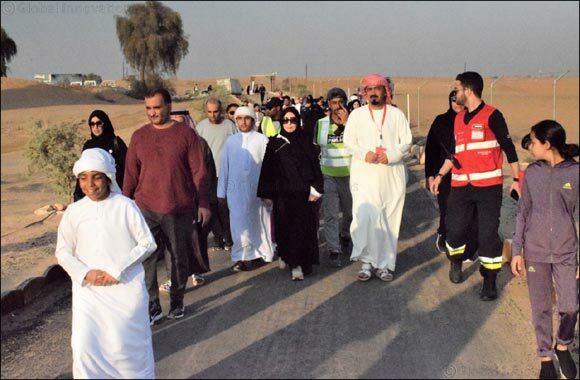 The “One Hour Walk” event was organized with the aim of expressing solidarity with arthritis patients and to mobilize support from both individuals and institutions in order to help alleviate their suffering and burdens. The event was also organized to promote the association's 7th Annual Marathon, which is organized at the end of February and includes thousands of participants that belong to different nationalities and age groups. HE Major General Saif Al Zari Al Shamsi, Commander-in-Chief of Sharjah Police, stated that the cooperation with the Friends of Arthritis Patients Association at the Supreme Council for Family Affairs in Sharjah is part of the social responsibility initiatives of Sharjah Police. He added that this cooperation also aims to support Arthritis patients and enhance awareness efforts to promote early testing for this disease, in addition to encouraging physical activity and walking to ensure a healthy society that is free of diseases in accordance to the wise leadership of Sharjah. Waheeda Abdul Aziz, Head of the Friends of Arthritis Patients Association, stated that organizing this initiative regularly comes as a translation to the vision of Her Highness Sheikha Jawaher Bint Mohammed Al Qasimi, Wife of His Highness the Ruler of Sharjah and Chairperson of the Supreme Council for Family Affairs, and her directives to enhance health awareness in the emirate by highlighting health issues that enhance Sharjah's reputation as the leading healthy city in the region. She also expressed her thanks to Sharjah Police for their cooperation with the association in ensuring the success of the important event. During the “One Hour Walk 2” event, which is organized regularly at different locations in the Emirate of Sharjah, the association distributed leaflets to raise awareness on arthritis, offered free health tests to participants, and arranged many other sport and recreational activities. Sharjah Police also provided a health lecture that reviewed the benefits of walking and performing sport activities.